Have you ever wanted to bowl on flat oil? It’s basically the hardest pattern possible in the sport of bowling and it’s what the pros in the PBA bowl on in the US Open. This is where the pros actual look like mortals and throw their lowest games categorically. For regular Joes like me and you though the pattern doesn’t just feel hard… it feels almost impossible! If you decide to shoe up for a flat oil experience then you should expect game after game of low and frustrating scores. How can this possibly fun? I can’t explain it. I love bowling on super hard patterns just to see how well I can deal with the condition and I’m sure lots of other people feel similarly. So with this in mind Mounts Bowling is planning to run it’s first bowling tournament ever. I’m calling it The Flat Oil Challenge and it’s going to be hosted out of The Epicenter in Klamath Falls, OR on Saturday, January 27, 2018. Check-in will be at noon and warm-ups will begin at 12:30. Because the tournament pattern will be so hard I am planning on using this event to unveil an unconventional tournament format to help keep things fun game after game, even for those who are struggling mightily. The tournament will be six games. Each game will have it’s own prize fund with a payout ratio of 1:2 per game. There will also be a series prize fund with a 1:2 payout ratio. The top half of the field for each game (and for the series) will win money – everyone “in the money” will earn the same amount. 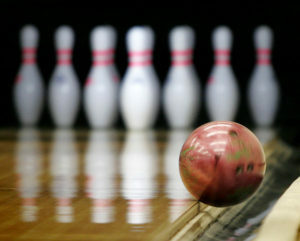 There will be a step-ladder finals for the top three bowlers with a separate prize for 1st, 2nd, and 3rd. There will not be a sliding scale of winnings per prize fund. If you barely make the top half you will make just as much as the person with the highest game. The way to win the most money is to be in the top half of the field for each individual game and series and then make it into the top three step-ladder final round. A format like this means that at bare minimum half of the tournament bowlers will make most of their money back if not more than their entry fee… but no one will be able to make the lion’s share of the overall prize fund. There is actually a chance for every single bowler in the tournament to make at least a little bit of money back. I’ll update this page with more information as the event approaches. I am keeping an interest list for this tournament in addition to the actual roster of committed bowlers. If you are interested in the concept of this event and would consider participating then please let me know by filling out the interest list form here. If you are committed to bowling the event then let me know in person, via email, text, or on Facebook… or just sign up for the interest list through the link above and I’ll contact you about it. If you put your name on the interest list linked to above I have probably contacted you already. The following names are those bowlers who have committed to bowling the event.